The Tifosi Escalate S.F. Sunglasses is a perfect sunglass for multiple activities, which features 3 lenses and comes with matte black/crystal blue frame. The sunglass frame is made from Grilamid TR-90, is an incredibly light and durable nylon material that resists chemical and UV damage. It features a unique Interchangeable Component System, that integrates full frame, half frame and/or shield eyewear into one complete kit. The Escalate S.F. 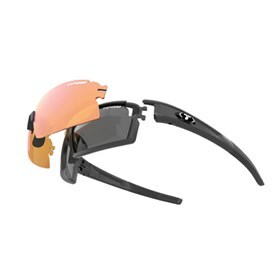 Sunglasses features Tifosi Lens Technology decentered shatterproof polycarbonate lenses. The sunglasses features vented lenses, preventing from fogging and are easy to install. The Tifosi 1221200101 has many exciting features for users of all types. The Tifosi 1221200101 is sold as a Brand New Unopened Item.